Peer Kock's J/24, above, won the 43 boat fleet Kiel Week 2013. UK Sailamakers' J/24 sails are designed for easy trimming and maximum performance in all wind and wave conditions. The sails are manufactured using the best materials on the market and designed with our proprietary 3D AccuCut design program and Azure Project, which allows us to constantly monitor and update designs and tuning guides. The experts here at UK Sailmakers can ensure that our J/24 one-design sails will meet or exceed your expectations. Our designs are continually updated, taking advantage of the latest sail testing, newest materials, and on the water results. The J/24 tuning guide will help you precisely tune the rig and trim the sails, freeing up the crew to concentrate more on tactics and speed. UK Sailmakers offers an all purpose mainsail, two genoa models (Pro & Club racing), two jib models (Medium & Heavy) and a running spinnaker. The J/24 AP Mainsail is designed to be maximum size. This sail was originally designed for medium air, but has proven to be an all-around performer. Now you do not need to worry about having another mainsail when traveling to other events where you may encounter different wind conditions. However, if you sail in predominantly heavy wind conditions, the H1 Mainsail is designed exclusively for heavy air with more luff curve and less camber. Cut: Cross-cut panels with elliptical radial head and radial reinforcements for clew and head allowing longer durability. Created with Azure Project design software. Cloth: Dimension Polyant 260HTP high aspect dacron and 265SQ square-weave dacron for radial head and patches. Features: RBS tapered battens (including both hard and soft top battens), draft stripes, leech line, spreader patches, visibility windows, cunningham, sail numbers, and bag. UK Texas launched it's first Aramid Genoa in 2009 as soon the class approved it. Since the beginning we opted to use string sail technology. Utilizing all of our experience with the successful Pentex Tape-Drive genoa, we compensated for the stretch in the materials, and in 2011 we revised our designs with Mauricio Santa Cruz (three- time World Champion), and updated our tuning guide. Our membrane loadpath construction, made of black aramid fibers, is designed as an all purpose sail. It is minimum class weight and easy to trim. Material: Black Aramid loadpath yarns laminated inside two 3-D shaped Mylar skins. The Tri-Radial Genoa was created for durability; this is the sail to choose if you need a genoa to last more than a couple of seasons. Made with black and gold aramid in a tri-radial cut, it is almost the same weight and is slightly more flexible than the membrane sails. However, it is more durable, lasts more seasons of racing, and excels in light to medium breeze. Material: Dimension Polyant Aramid X05 at front and X10 on Leech and Foot. Features: cunningham, visibility windows, foot patch, bronze hanks, sail numbers, draft stripes & roll bag. Dave Suda, sailing PACEMAKER won the 2012 Australian Nationals using a UK Sailmakers Titanium Genoa. The Heavy Jib is made with 7.2oz square Dacron, using a Tri-radial cut. It was designed for heavy winds more than 20 to 25 knots True. It is flatter than the Medium Jib with a more rigid shape. This sail is ideal for a professional crew that can hold the genoa up in wind speeds of about 22 knots. Cut: Tri-radial panels with radial patches. Designed with Azure software. Features: cunningham, visibility windows, bronze hanks, RBS battens, draft stripes & roll bag. Once the wind picks up to 18 knots, you will need to switch to the little jib. This jib is designed for heavy winds, but it utilizes cross cut construction, allowing it to be used in moderate wind conditions if necessary, which is a great advantage if the wind suddenly dies half way through the leg or when carrying the Genoa is too difficult for your crew. Cut: Cross-cut panels with radial reinforcements for clew and head allowing longer durability. Designed with Azure design software. Our AP Spinnaker is designed to take advantage of the maximum size that the class allows. In fact we even extended the leech between the tack and the mid girth for an extra power. 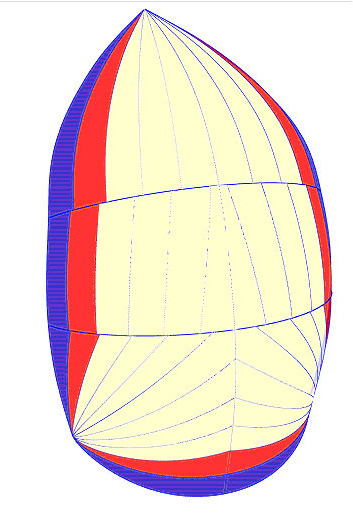 The UK Texas J/24 spinnaker was created with very stable shoulders for easy trimming. You don't need a professional trimmer to get the most out of this sail, unlike some other sails on the circuit. Being so stable, the sail opens quickly when set and re-fills faster after a collapse. This feature helps you gain extra boat lengths on the competition. Cut: Matrix radial with oriented sections, matching thread line to load paths Designed with Accucut software.